Support Us – ©2019 United Cerebral Palsy Association of Greater Suffolk, Inc.
Do you believe in love at first sight? Well Jonathan does. What began as a beautiful friendship has blossomed into a 21st century love story. Jonathan has limited use of his arms and legs, is confined to a wheelchair and is nonverbal. Anyone who knows Jonathan knows that he does not allow his limitations to define him. Jonathan communicates with those around him thru an assistive communication device. Jonathan has always loved the arts and began painting in the early 90’s. Eric, his Recreational Therapist saw something extraordinary in Jonathan and knew he was more than just a talented artist. Jonathan began taking private painting lessons with Eric at the Huntington Art Center. One extra-special piece of artwork is a painting of the Huntington Lighthouse. The President of the Lighthouse was so enamored of the piece that it remains on site at the lighthouse to this day, for all to enjoy. Betsy has limited use of her arms and legs, is confined to a wheelchair and is nonverbal. Like so many young women, she loves fashion and music. Her favorite activities include singing along to songs from the 70’s while dancing in her wheelchair. 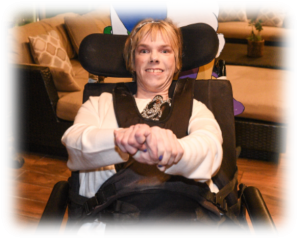 Betsy’s love of music, dance and performance led her to join UCP’s in-house musical group called “The Sensations”. The Sensations perform at UCP events and in the community. 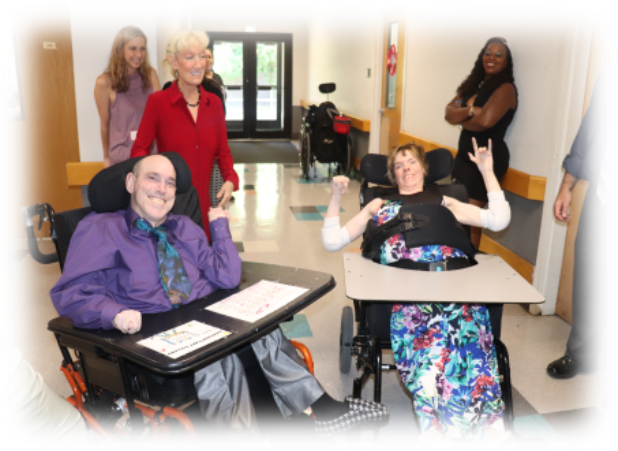 Most recently, The Sensations showcased their talent at the UCP Life Without Limits Gala to the delight of those in attendance. Betsy’s love of music and the arts is always evolving and she is continuously developing new talents. Today, Betsy is learning how to strum a guitar and pursues her love of math by spending time solving mathematical equations. Jonathan began courting Betsy when they met in their residential home. Using his communication device, he has learned to communicate with those around him and invites Betsy to join him in their residential sensory room to watch movies and exercise together. Jonathan introduced Betsy to his love of painting. As an expression of his love, he gave Betsy one of his greatest gifts, private art lessons with his former therapist, Eric. And Betsy encouraged Jonathan to join her in “The Sensations” (he said “yes”). This affords them both the opportunity to spend more time together, doing the things they love. Who says love isn’t grand! Every Valentine’s Day, he makes sure to shower her with flowers and a teddy bear. But his favorite thing to do with Betsy is to express his love through his passion for painting. Over the years, he has gifted her so many paintings that the walls of her room resemble an art gallery. With Betsy by his side, Jonathan’s dreams and goals grew. His love of art extends to friends as well. 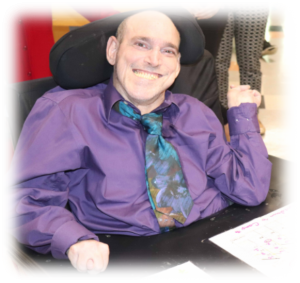 Using his communication device, Jonathan became the voice for himself, Betsy and friends who wanted to paint regularly and more importantly wanted a place in UCP-LI to display their artistic creations. Thanks to Jonathan’s vision, and with Betsy’s encouragement, Johnny’s Way, UCP-LI’s art gallery is a place where friends come together to express themselves artistically. While we are very proud of Johnny’s Way, it is still in its earliest stages. A formal Grand Opening is planned for late January 2019. Won’t you be a part of something special! Your generosity enables us to give individuals like Jonathan and Betsy the opportunity to pursue their dreams and continue Life Without Limits. On behalf of each of the 3,500 children and adults we serve annually THANK YOU for making a difference in their lives. Please consider making a generous contribution today so that we can continue to create Life Without Limits. Did you know UCP of Long Island . . . Your support truly makes a difference and helps create Life Without Limits for children and adults with disabilities! Thank you. ©2019 United Cerebral Palsy Association of Greater Suffolk, Inc.